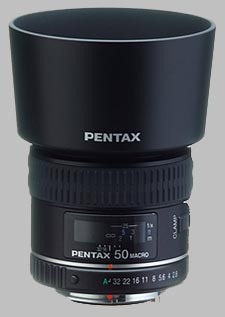 (From Pentax lens literature) The Pentax SMC P-D FA 50mm f/2.8 Macro is optimized for digital cameras. It utilizes curvature and positioning of optical elements to virtually eliminate flare and ghosting for clear, high-quality images particularly important to digital photography. This versatile lens can also be used as a telephoto lens and features our acclaimed multi-layer coating to lower surface reflection, reduce ultraviolet rays, and deliver clear, high-contrast images. Very versatile lens, useful not just for macro, but also portraits, landscapes, etc. The sharpness and contrast is terrific even when combined with teleconverter, tube, or dioptric attachment lens. This gives so much more combinations and possibilities. I do not like the extending plastic barrel, but otherwise the design is good, making the lens very enjoyable to use. Highly recommended (if you treat your lenses well).